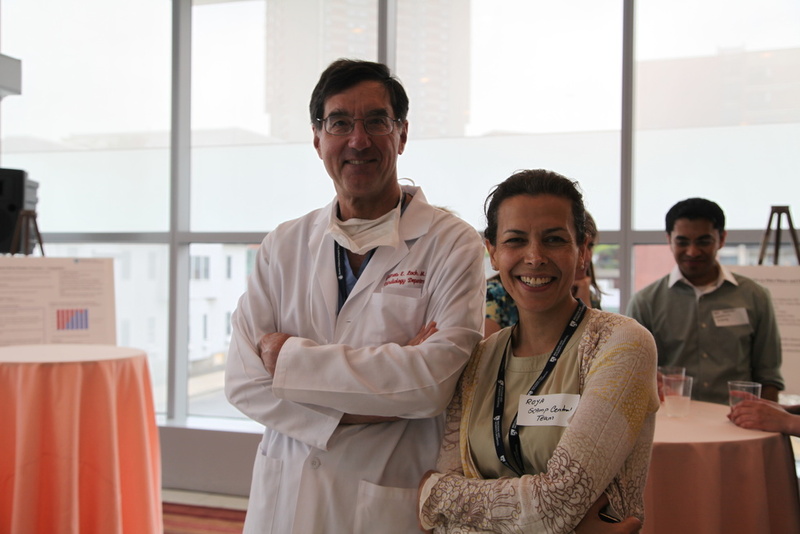 SCAMPs founder James Lock, MD, of Boston Children’s Hospital, and Roya Ghazinouri, PT, of the BWH SCAMPs team, pose for a photo during the one-year anniversary of SCAMPs at BWH. Chest pain is one of the most common reasons people come to the hospital, but there isn’t one standardized way of treating it. The variation comes in with those in the gray area—they may be having a heart issue, but testing is needed to find out for certain. “There isn’t a great single test that determines who is having a heart attack or at risk of a pre-heart attack,” he said. That means that there isn’t a standardized way that care providers treat these patients. Physicians may discharge patients home for follow-up with their doctors if they are assessed as low risk, and others use one or more tests—blood tests, stress tests, MRI or cardiac catheterization—to determine what is wrong. In areas where there is such variation in practice, BWH clinicians are turning to SCAMPs as a way to develop guidelines for best practice. The hospital is quickly emerging as a leader in the use of SCAMPs, or Standardized Clinical Assessment and Management Plans, which collect and analyze data on clinical decisions to standardize care in a fast-evolving clinical environment. SCAMPs, which were originally developed at Boston Children’s Hospital, are one of the strategies being implemented in care redesign efforts throughout BWH and BWFH. BWH has a dedicated SCAMPs team to partner with clinicians on designing and implementing a SCAMP and collecting and managing the data. “SCAMPs enable us to transform care and standardize it in a way that still maintains flexibility for individual patients’ needs,” said Jeff Greenberg, MD, MBA, who is leading the SCAMPs team at BWH. In designing a SCAMP for chest pain, Scirica’s goals were to find out what symptoms patients with chest pain presented with and what their co-morbidities were. The team enrolled 122 patients who had been admitted to the inpatient cardiology service in the SCAMP to collect data to answer these questions. Scirica and his team then asked physicians to estimate when they first saw a patient, did they think: a) it was a heart attack, b) it had nothing to do with the patient’s heart, or c) that there was a chance this was a heart attack. Option C is the gray area where the variation in treatment comes in. After reviewing the data collected and analyzed during the first six months of the SCAMP, Scirica and the team found great heterogeneity in practice. The next step is to put in place parameters that are reasonable best practices for most patients who present with chest pain. It doesn’t mean a “one size fits all” approach to care, though, as SCAMPs reinforce tailoring care and deviating from the standard when it makes sense for a particular patient. BWH recently celebrated the one-year anniversary of the launch of SCAMPs and its progress. Today, eight SCAMPs are underway at various stages in multiple departments. Philip Blazar, MD, of Orthopedic Surgery, and his colleagues launched the hospital’s first SCAMP on distal radius fracture last year.